As commuters trickled into a mostly unscathed New York City on Monday in the wake of Hurricane Irene, raging rivers continued to cause record flooding all across the north-eastern United States and electricity companies struggled to restore power to 5 million darkened homes and businesses. Post-Gaddafi, who can unite Libya? Libya’s interim leader today gave forces loyal to deposed ruler Muammar Gaddafi a four-day deadline to surrender towns still under their control or face military force. 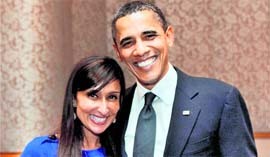 Four Indian-Americans have emerged among the key fund raisers for Barack Obama, raising almost a million dollars among themselves for the US President’s re-election campaign. Damaged and blocked rail lines more or less shut down morning commuter services from the suburbs to Manhattan, which had itself emerged mostly intact from the storm. Wall Street was open on Monday and the US Open Tennis Tournament began in Queens as planned. Some questioned whether the authorities had unnecessarily overstated the dangers associated with Irene in the hours before she struck. 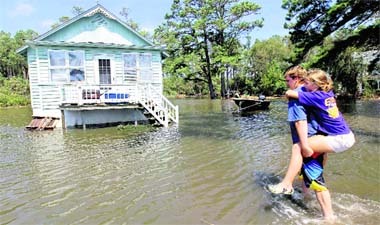 The hurricane’s legacy was nonetheless one of misery for many. At least 21 persons died in the US before it crossed into eastern Canada. One man in a suburb north of New York City died trying to help a father and son entangled in live power lines. After being electrocuted himself, he fell into a puddle of water that was also live, preventing horrified onlookers from pulling him away. In New Jersey, Celena Sylvestri, 20, called the police to say she was up to her neck in flood water in her car. When a rescue team found her eight hours later still at the wheel she had drowned. Some of the heaviest rainfall was in the Catskill region of New York and in Vermont which last night was confronting its worst floods since 1927, with roads washed out and buildings partially destroyed, as well as one of Vermont’s famous covered bridges in the town of Rockingham. Vermont is not a place you would associate with a tropical storm. Yet floodwaters surged through Brattleboro, one of its biggest towns, and officials said the worst is still to come. As the hunt for Gaddafi himself goes on, Libyan officials accused neighbouring Algeria of an act of aggression for admitting his fleeing wife and three of his children. Algeria’s Foreign Ministry said Gaddafi’s wife Safia, his daughter Aisha and his sons Hannibal and Mohammed had entered Algeria on Monday morning, along with their children. That stirred a diplomatic row just as Libya’s interim council works to consolidate its authority and capture places still loyal to Gaddafi, notably the coastal city of Sirte. “By Saturday, if there are no peaceful indications for implementing this we will decide this matter militarily. We do not wish to do so but we cannot wait longer,” Mustafa Abdel Jalil, head of Libya’s interim council, said. Anti-Gaddafi forces have converged on Sirte from east and west, but have stopped short of an all-out assault in hopes of arranging a negotiated surrender of Gaddafi’s birth-place. Gaddafi has been on the run since his foes captured his Tripoli compound on August 23 and his 42-year-old rule collapsed after a six-month uprising backed by NATO and some Arab states. Gaddafi was in Tripoli until Friday when he left for the southern desert town of Sabha, Britain’s Sky News reported, quoting a 17-year-old bodyguard of Gaddafi’s son Khamis. It quoted the unnamed captured youth as saying Gaddafi met Khamis, a feared military commander, at around 1:30 p.m. on Friday in a Tripoli compound that was under heavy rebel fire. Gaddafi had arrived by car and was soon joined by Aisha. After a short meeting, they boarded four-wheel drive vehicles and left, the bodyguard told a Sky reporter, adding that his officer had told him: “They’re going to Sabha.” Along with Sirte, Sabha is one of the few remaining places in Libya where pro-Gaddafi forces are holding out. A NATO spokesman said reports of talks over Sirte were encouraging, but said the alliance, which has kept up a five-month bombing campaign, was targeting the city’s approaches. “Our main area of attention is a corridor... (leading up) to the eastern edge of Sirte,” Colonel Roland Lavoie told a NATO briefing in Brussels. A spokesman for the National Transitional Council said it would seek to extradite Gaddafi’s relatives from Algeria, which is alone among Libya’s neighbours in not recognising the NTC. Nearly 60 countries have acknowledged the NTC as Libya’s legitimate authority. Russia, China, India, South Africa and Brazil are among those which have so far withheld recognition. According to OpenSecrets.Org, a sum of $35 million of the total $86 million raised by the Obama’s campaign so far, has come from 244 individuals. Among them, the four top Indian American ‘bundlers’ — Azita Raji, Shefali Razdan Duggal, Deven Parekh and Kavita Tankha — alone have raised about a million among themselves. As per latest available figures, California-based investor Azita Raji has helped contribute at least half a million for Obama’s re-election campaign. She is a member of the Democratic National Committee and the National Advisory Board. Raji is followed by New York’s Deven Parekh of the Insight Venture Partners, who helped raised between $200,000 and $500,000. Shefali Razdan Duggal and Kavita Tankha, both from California, have each raised between $50,000 to $100,000, latest campaign fund statistics reveal.